I couldn't put down this adventure story. The tag line "Two boys with too many secrets" is a good description, because I was really worried about what would happen to these boys! In this riveting middle-grade adventure, the son of a Mississippi policeman finds a boy living on his own in the wilderness. Twelve-year-old Sam has been given a fishing boat by his father, but he hates fishing. 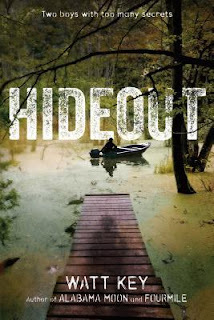 Instead he uses the boat to disappear for hours at a time, exploring the forbidden swampy surroundings of his bayou home. Then he discovers a strange kid named Davey, mysteriously alone, repairing an abandoned cabin deep in the woods. Not fooled by the boy’s evasive explanation as to why he’s on his own, Sam becomes entangled in his own efforts to help Davey. But this leads him to telling small lies that only get bigger as the danger increases for both boys and hidden truths become harder to conceal. 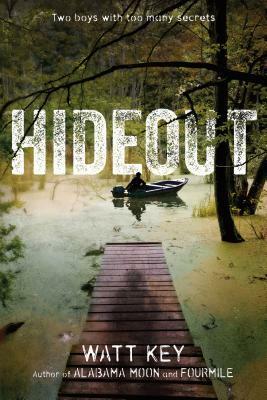 Hideout was written by Watt Key and published by Farrar, Straus & Giroux in 2017. 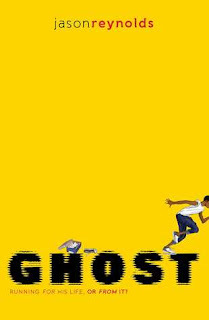 It’s a fast-moving adventure story of a boy who wants to prove himself but ends up getting in over his head. I liked Sam’s personality. He wanted to be independent and solve his own problems and he tried to stay loyal to his friends, even through difficult situations. Now I want to read more books by Watt Key. This book would be a good class read aloud and might lead to interesting discussions about honesty, trust and decision-making. Sam starts by telling small lies, but they end up growing as he gets more involved and the situation becomes more dangerous. Watt Key has written several other books including FOURMILE and TERROR AT BOTTLE CREEK. You can read an excerpt of HIDEOUT on the website www.criminalelement.com. I really loved this - so succinct and clever in the way it plays with the traditional fairy tale. But be warned. It's a little dark, especially the ending! The perfect gift for fans of darker fairy tales, complete with tree-shaped cover flaps that make this a sumptuous sight to behold. 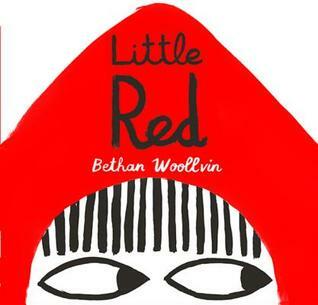 Little Red was written by and illustrated by Bethan Woollvin. It was published in 2016 by Two Hoots. I really loved this clever take on a classic story. With just the original characters and a simple text, the author has created a darkly humorous and very entertaining story. I loved the repetition of “Which might have scared some little girls. But not this little girl.” The careful use of colour (black, white and red) and size really enhances the darker moments in the text. The importance of the expressions shown in the character eyes reminded me of the “Hat” books by Jon Klassen. I’d study this one carefully to see how the text leaves room for the illustrations, and also how the text and illustrations leave room for reader interpretation. Although I really admired this one, I think it might be a bit scary for a couple of my younger kindergarteners. For slightly older kids, it would be great to contrast this book with the classic story and highlight Little Red’s more progressive and active role in dealing with the wolf. Create puppets to represent the grandmother, wolf and Little Red and act out the story. Draw a picture to show what Little Red’s plan might have looked like. Why do you think the author left out the woodsman character from the original story? Discuss.